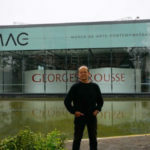 Coating Développement names its more innovative products designed for the graphic art market. We associate our product’s technical characteristics with a brand name, thus allowing their immediate identification and conveying their special features. 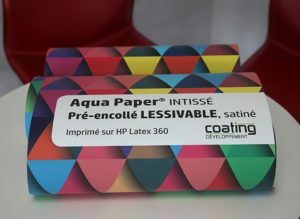 Aqua Paper®, an innovation in its printable version, washable and M1. Wall covering, nonwoven, printable for interior decoration. This product was developed by Coating Développement to answer the needs of the wallpaper market with the development of a personalised wall covering, linked to the evolution of numerical printing technologies. Arrived on the market in 2014, Aqua Paper® was in the news for its innovative pre-pasted glue, reactivated with a simple water spray. In 2016, two new versions completed the product range with washable Aqua Paper®. AQUA PAPER® – How to hang wallpaper ? Available in widths of 914mm and 1370mm, and rolls of 30m, 40m or more. Begun at the end of 2011, this nonwoven media was developed to make banners or tight canvas for exterior events. 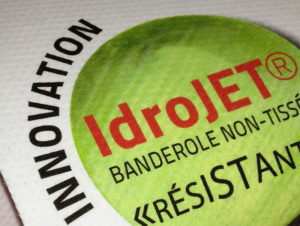 L’idroJET® is a printable coated inkjet banner, light, soft and rip resistant and also waterproof. Thin banner, anti-curling, M1, inkjet. In 2014 Coating Développement perfected a coating for a thin banner with fireproofing M1 also printable with aqueous ink. 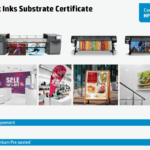 This media is very flexible, has a low light reflection and is printable with pigment ink, latex and solvent. Paper M1, 190g, for solvent print.